The Clockworks Court is an outdoor area of the Old Clockworks in Luigi's Mansion: Dark Moon. The Clockworks Court is a large, open area covered in sand. There are several clocks on the ground that show the time 3:30. There's a telescope and a bar that can be raised by using the Strobulb on it. To the left side, there is a portion of railing missing that can be revealed by using the Dark-Light Device. On the other side of this railing is a Treasure Chest with random loot depending on the mission. Luigi can inspect a window here to get a view of the Warehouse. To the right of this is another area with metal fans and a hidden treasure chest. The debris can be destroyed by activating the robotic bomb by it. Taking the door to the north takes Luigi to the Warehouse. In a late mission, an entrance to the Storm Cellar becomes available. 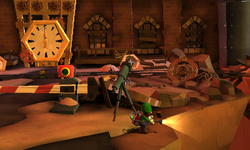 During C-1: A Timely Entrance, Luigi can use the telescope to see the Overset Possessor near the Belfry. The treasure chest on the left side contains twenty bills. Before Luigi can enter the Warehouse, he needs to set the correct time on the clock that is blocking the door. Exploring the vicinity reveals that the time Luigi needs to set the clock on is 3:30. In C-2: Underground Expedition, Luigi needs to go to the south side of the Clockworks Court. Luigi uses the special compass obtained in the previous mission to create an entrance to the Storm Cellar. The treasure left on the left has three gold beetles in this mission. In C-4: Play Catch, three Greenies are seen playing with the hour hand in the Clockworks Court. However, the Polterpup steals the hour hand and runs into the Warehouse with it as the Greenies chase after it. There is also a golden robotic bomb inside the treasure chest to the left that gives five Gold Bars when it explodes. Starting on C-1: A Timely Entrance and most missions after, Luigi can go to the far right side of the Clockworks Court to find a dead end. However, shining the Dark-Light reveals a hidden treasure chest that contains a ruby. This page was last edited on May 1, 2017, at 21:15.